Colombia is suffering the worst drought and forest fires in the country’s history because of weather phenomenon El Niño. According to meteorologists, the situation is likely to get worse. El Niño is the warming of the eastern tropical Pacific Ocean which occurs every few years and affects the weather pattern of the tropics, causing heavier than usual rainfall in some areas such as Peru and Ecuador but unusually hot and dry weather in Colombia, resulting in drought and forest fires. Colombia’s Housing Minister, Luis Felipe Henao, told El Tiempo newspaper that this drought is the worst that Colombia has seen for decades and that the last three years have been the driest that the country has ever suffered. Rainfall has been extremely low causing the rivers to dry up. The Magdalena river is at its lowest level on record. Its average flow is 7,200 cubic meters per second and currently at several sections this level has fallen to less than half. The Cauca river is also dangerously low, the Pance river is dry and it is possible to cross the rivers that hydrate Santa Marta on foot. So far this year 3,421 forest fires have been reported which has affected 77,300 hectares of woodland, 70% of the annual deforestation rate. According to Ideam, the meteorological institute, October, November and December will see even higher temperatures and therefore the drought is set to get much worse before it gets better. La Guajira, Bolivar and Magdalena in the north, Valle del Cauca on the Pacific coast, Boyaca and Cundinamarca in the center and Tolima and Quindio in the western central region are the most affected departments in the country. Water restrictions have been put in place in 130 towns in total. Rationing could also be imposed in 312 more towns. Cundinamarca has water restrictions imposed in 60 of its municipalities. Valle del Cauca has 16 towns with enforced water restrictions including its capital, Cali. Magdalena has 13 rationed towns including its capital, Santa Marta. In Bolivar 14 towns have restrictions and in Boyaca, 10. According to Henao the department of La Guajira is experiencing a rainfall deficit of 78%, Magdalena has a deficit of 54%; Atlantico, 48% and San Andres, 47%. All of these departments are on the north coast of Colombia. So far the capital, Bogota and other large cities, Medellin and Barranquilla have not had to resort to rationing. According to Henao the government, businesses and citizens alike can all do something to help the situation. Incentives for saving and fines for wasting water have been established which reduced the consumption of water in certain regions. In total 656 emergency plans have been put in place across affected regions. The state imposed water restrictions on many of the affected areas in order to ration the water supply. Each town is managing the water restrictions differently. Some have arranged a daily rationing with water available for a few hours a day and some have imposed a weekly rationing. So that the residents are not left without water to drink the state is setting up reservoirs and wells and sending lorries to affected towns, delivering sufficient water for the week, Henao told El Tiempo. The government has disconnected illegal diversions from the rivers in Valle del Cauca and La Guajira where businesses had diverted water in order to grow rice or bananas, for example. They are now monitoring the level of the rivers. Ramiro Muñoz, sub-commander of La Vega fire department told Vanguardia that often the forest fires are started by people dropping cigarette ends or pieces of glass and asked the population to take better care of their environment. 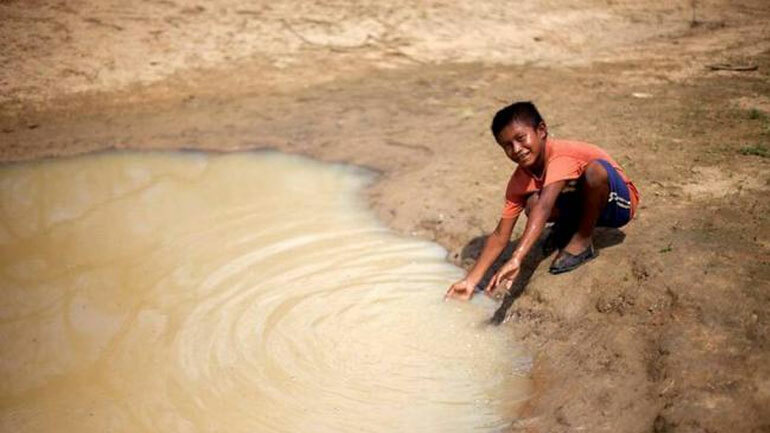 Henao begged Colombians living in regions currently still with a normal water supply not to waste water and to think about a child elsewhere in the country who could desperately need it. The effects of the worst drought in Colombia’s history caused by El Niño are not set to improve until March 2016, according to Ideam.